This little girl takes homelessness to heart. Jaelyn Sagen never imagined there were people living in her own community who faced homelessness. Though hard to understand at first, this six year old girl decided to do something about it. She set up a lemonade stand to “help people buy homes in our community.” With the help of her mom she hung signs throughout the neighborhood and sent out emails to over 300 people. Fundraiser extraordinaire, Jaelyn Sagen set up her lemonade stand once again to benefit We Care Los Alamitos. Now in her fourth year, she raised more than a $3,300 for the organization! 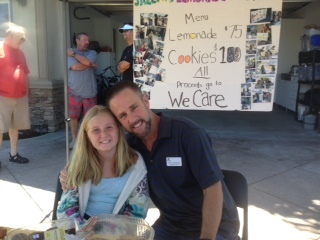 Once again, fundraiser extraordinaire, Jaelyn Sagen set up her lemonade stand to benefit We Care Los Alamitos. This year she raised more than a $1,600 for the organization. Congratulations on making a difference in our community. This year, Jaelyns goal was to sell a $1,000 worth of lemonade to benefit We Care Los Alamitos. With the help of fellow soccer players and their families as well as the surrounding community, she raised more than a $1,000 in three hours. Congratulations on setting and achieving such an ambitious goal and making a difference in our community. For four hours she sold lemonade and cookies to passersby. And with additional donations from friends and family, Jaelyn raised $350 and donated all the proceeds to WE CARE.